Advanced Technocracy Inc. is Manufacturer, Exporter & Supplier of Le Chatelier Flask. 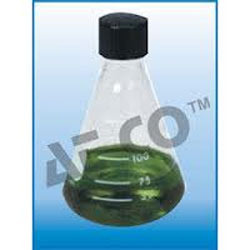 We manufacture dissolution apparatus as per UPS Standard Dissolution Flasks used for tablate testing. Capacity 1000ml & 2000 ml. We manufacture this jar from best quality borosilicate glass. These flasks are ideal for determining dissolution characteristics of drugs in capsules & tablates. We are involved in providing a comprehensive array of Lab Flasks to our most reliable customers which are located all round the nation. Besides, we ensure that our experts make use of quality material in making the array in order to ascertain that the high expectations of our valued customers are properly met. A conical flask glass, brass rod with disc & gold leaf attached, supported in cork with polythene insert. - FLASK VOLUMETRIC with interchangeable stopper, Accuracy as per class "A". - FLASK VOLUMETRIC with interchangeable stopper, Accuracy as per class "B'. - FLASKS VOLUMETRIC sugar estimation with two marks without stopper. - KOHLRAUSH FLASKS (MUD FLASK) with cup at top. Volumetric flasks are useful for containing and measuring accurate amount of liquid in analytical chemistry. Made from heat-resistant glass, our volumetric flasks come with a stopper for capping the opening at the top of the neck. 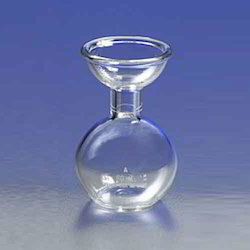 These volumetric flasks can be used as decanters also. Borosilicate glass with flaring, funnel shaped cup with stopper. Capacity:- 100, 150, 250, 500, 1000 ml. 02.296 Flasks, Erlenmeyer, “LABOGLASS, Conical, Narrow mouth, with approx. graduation.